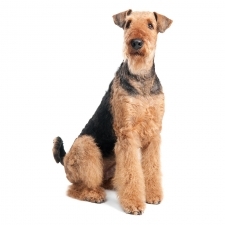 Unlike many other dog breeds, the origin of the Airedale is well-known. The breed was created 150 years ago by working class farmers in a valley in the West Riding of Yorkshire, along the River Aire. They were cross bred from a Welsh Terrier and an Otter Hound and quickly became one of the most popular Terriers. They were officially recognized in 1886. It is the largest of all the Terriers and was originally bred to hunt vermin such as rats. The Airedale Terrier is so big that he cannot easily go underground, as so many of the Terriers do, but he is quite efficient at catching the rats once they surface. The Airedale ranks high in intelligence and is used extensively as messengers or police dogs. The Airedale is known to be a loyal and very intelligent breed. They are also known to be independent and strong-willed, and will often form a close bond with their master and family. The Airedale is extremely social and does not respond well when left without human companionship for long periods of time. He can be destructive if he gets bored. He is also a very active dog and requires quite a bit of exercise. Early training is very important for this breed because they can be quite stubborn at times. They live peaceably with other dogs and with children if they are properly trained. The Airedale has a large, square body and incredibly straight front legs and a deep, wide chest. It has a long head and muzzle that are both broad and flat and small pointed ears that are almost always folded down. Its tail is usually docked and tends to be black. The largest part of the body is tan, with black and sometimes reddish markings. The double coat is waterproof with a coarse and wiry layer that is lined by a softer, warmer fur that is characteristic of the Otter Hound. John Wayne had an Airedale named “Duke.” There are some who claim that this is where he got his own nickname. These guys have been owned by several Presidents - Theodore Roosevelt said that Airedales could do anything any other dog could do, then whip the other dog if it had to. Warren G. Harding’s Airedale had his own hand-carved chair at Cabinet meetings and is even immortalized with a statue in the Smithsonian. The Airedale was among the first breeds used as police dogs in Germany and Great Britain. They have been dependable message carriers in several wars, able to get information delivered fearlessly, even when injured. This breed was used as a war time guard, messenger, rodent control agent, and hunter. Two Airedales even went down with the Titanic. Previous names are Working, Waterside, and Bingley Terriers.